"CNR Radio or CN Radio (officially the Canadian National Railways Radio Department) was the first national radio network in North America. 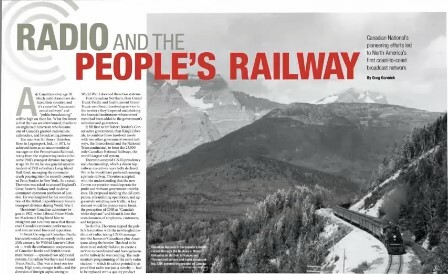 It was developed, owned and operated by the Canadian National Railway between 1923 and 1932 to provide en route entertainment and information for its train passengers. As broadcasts could be received by anyone living in the coverage area of station transmitters, the network provided radio programming to Canadians from the Pacific coast (at Vancouver) to the Atlantic coast (at Halifax). During its nine-year existence, CNR Radio provided music, sports, information and drama programming to Canadians. Programming was produced in English, French and occasionally in some First Nations languages, and distributed nationwide through the railway's own telegraph lines and through rented airtime on other private radio stations. However, political and competitive pressure forced CNR Radio to close, with many of its assets and personnel migrating to a new government-operated agency, the Canadian Radio Broadcasting Commission (CRBC), which ultimately led to the Canadian Broadcasting Corporation." Note: The article can only be accessed online by subscribers. If you cannot find a copy on the newsstand, check your library (they might be able order it if not on the shelf).